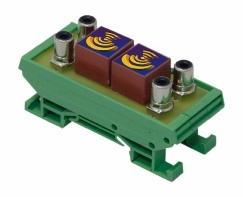 A line level audio isolating module on a din rail base. It comprises line level audio isolating transformers with twin phono connectors for both in and out. Ideal for ground isolation on audio signals, plasma screens and long audio cable runs.